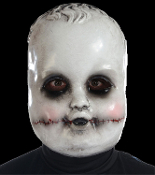 This creepy realistic Smiling Sammie Dreadful Dolls Collection mask features the face of a spooky doll with ghostly makeup and grayish white-washed death pallor. This scary mask also makes a great Halloween prop just hanging on the wall – add a glow stick behind the eyes for extra creepiness! Halloween prop building supplies... add to a haunted house dummy, guaranteed to scare!